You’ve heard of Rocky Mountain High, Bali Hai, High Noon, High as a Kite, and Hi and Lois, but now it’s time to experience Tokyo High. Well, technically, that should be ‘Tokyo Hai’. In Japanese the word ‘Hai’ has multiple meanings and in a typical conversation you’ll have one person speaking, with the other person responding after just about every sentence with “hai hai”. It means ‘yes’, ‘go on’, ‘I agree’, ‘tell me more’, ‘right’, ‘ok’, ‘uh huh’ etc. Once inside you walk along a corridor, on which a living map of Tokyo appears. The neighborhood in which the tower is located—along the Sumida River--is illuminated, and all of a sudden you realize that the people are moving, the cars are moving and the annual festivals at Asakusa Temple are actually happening in cartoon animation. It’s quite entertaining and amazing. And later on our hosts note that the colour of the ceiling previews the colour of the lights in which the Tokyo Skytree will appear that evening. Today the ceiling is purple and sure enough, the tower appeared in full regal purple that evening. Next you pass by the pipes and tubes that are actually holding up the tower—solid reassurance that your visit will be successful—before boarding one of the four elevators (representing the four seasons) to the 350 m level. 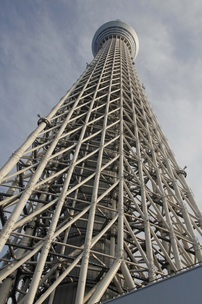 This is the main observation deck with grand vistas of Tokyo and area. We purposefully planned our visit just before sunset for the ultimate in colour. And the panorama of the river, the buildings in Odaiba and Shinjuku, and distant Mt. Fuji, all strutted their elegance. On this level you will find the glass floor where crowds lie, sit, kneel and play while the traffic rushes below. Those afraid of heights are nervously laughing as their friends try to coax them onto the glass. And then you can ascend even more to the higher observation level—which is angled to bring you from 445 m up to the maximum 451.2 meters.